Crunch. Crunch. Crunch. Imagine the crisp fall leaves crunching under your feet as you explore the picture-perfect fall views in Galena, IL. The colors are changing, and the local fall festivals are preparing to keep you entertained as you leap into fall this September. From the best leaf foliage to the national weather service’s color predictions, we’ve got everything you need to know about this year’s Galena fall colors. Shhh, it’s one of our best kept secrets. 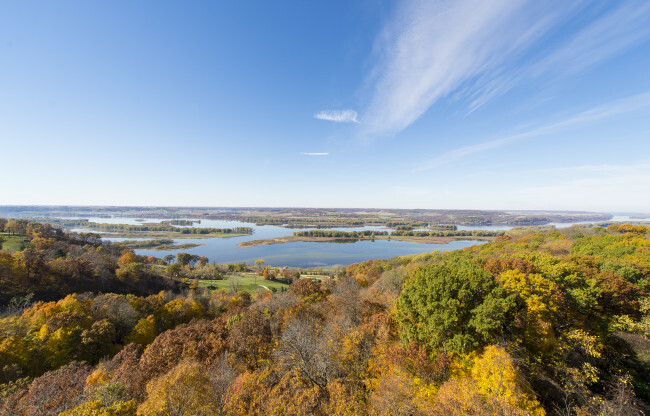 The best places to look at the breathtaking trees in the fall include Horseshoe Mound, Chestnut Mountain (of course), and the rest area in-between Highway 20 and Elizabeth. Can’t make it there? Chestnut’s mountain-top live camera is a great place to look at the beauty from afar. Soar above the trees and enjoy views from a hot air balloon ride with Galena on the Fly, zip through the fall foliage on zip lining tour with Long Hollow Canopy Tour, cruise down the river on Chestnut Mountains very own Mississippi River Cruise to get a little scenery, history and wildlife, or scooter through the vineyards on an e-bike from Fever River Outfitters. Say that three times fast. Galena is the place to be this September-October! It is Galena County’s busiest time of year and they have the festivals to prove it. Whether you want to Fall into Stockton for their annual celebration of fall, celebrate heritage at the 12th annual Oktoberfest, stomp grapes at the Galena Cellars Fall Harvest and Wine Festival, or even visit the annual Warren Pumpkin Festival, they have something for everyone to enjoy. Every year the national weather service’s puts out a fall colors report. To check out the updated status of this year’s colors and everything you need to know about leaf foliage, visit www.weather.gov. Need more to enjoy? Visit www.visitgalena.org for the best year-round events happening in beautiful Galena County.